March 2, 1975 "Definitive Series"
DATE OF ISSUE: March 2, 1975. STAMP SIZE: 30mm by 42mm. SHEET CONTENT: 50 stamps per sheet. PRINTER/DESIGNER: Formate International Security Printers Ltd. , London, England. Formate International Security Printers Ltd. was the designated Public Postal Licensee for Grenada. 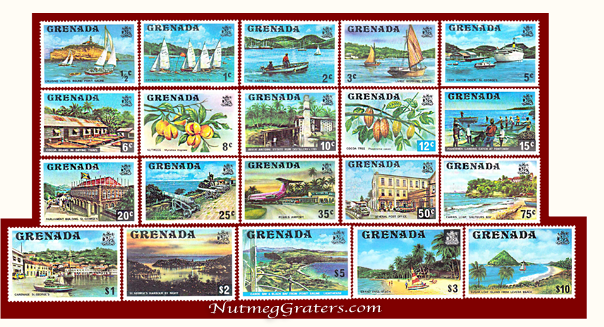 On March 2, 1975, Grenada's General Post Office released this "definitive series" of twenty stamps as the replacement of Grenada's earlier 1968 "definitive series". The stamp set illustrates key locations throughout the island and two cash crops ~ being the nutmeg and cocoa. Nicknamed "The Isle of Spice," Grenada is an island in the Caribbean, being one of the last major international growers to import and commercially cultivate the nutmeg tree. Siting Groome (1970), the Grenada National Trust reports that in 1843, nutmeg was first imported from the Banda Islands into Grenada in seed form by the Hon. Frank Gurney. These early trees, cultivated on the Belvidere Estate in the St. John Parish, were introduced as exotic ornamentals, rather than envisioned as a cash crop. When in the 1850's, the major world growers of nutmeg in the Straits Settlements, Malay Peninsula (Penang, Singapore and Province Wellesley) suffered a myristica blight, their nutmeg plantations were totally decimated. Aware of this disaster, Grenada's horticulturists took advantage of this situation in the 1860's by planting large numbers of nutmeg plantations which achieved economic success starting by the late 1870's. Today, Grenada is a major world supplier in nutmegs. 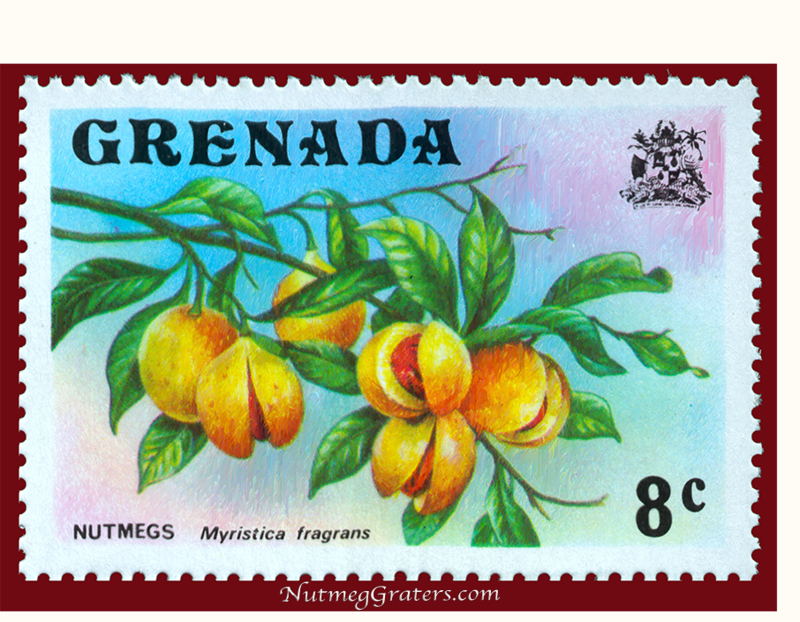 In commemoration of this, Grenada features their important spice ~ NUTMEGS Myristica fragrans ~ within this "definitive series" of postage stamps.